What better way to reap the benefits of various workout styles in the same routine than with a multi-purpose fitness system? The Supreme Toning Tower is the ultimate home exercise machine. If you've been thinking about building your own home gym, there is no better time than now! The Supreme Toning Tower would make the perfect addition to any size living space. 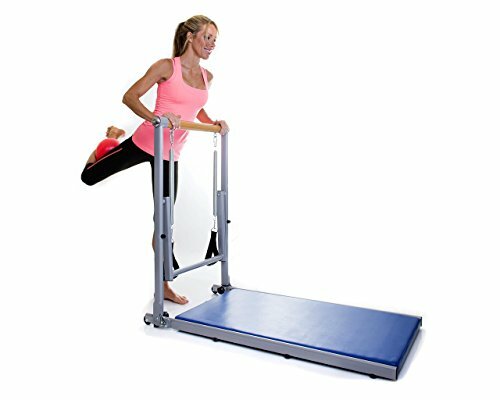 What's Included in the Home Fitness System? The Supreme Toning Tower ships with everything you need to create your own full-fledged fitness studio. It even comes fully assembled, including the built-in ballet barre made of wood, and the Pilates swing-thru bar. There's also a sculpting bar for the performing whole-body toning exercises. The fitness system includes two detachable resistance coils for when you're ready to take your workouts to the next level. The machine's sturdy frame is made of high grade steel, while the base is where you'll find a super comfy yet sweat-resistant Yoga mat. Just unbox your Supreme Toning Tower and start exercising right away with the two pre-included instruction and exercise DVDs! When you're finished, simply fold it up and roll it into storage using the pre-installed luggage wheels—no need for any heavy lifting. In fact, the entire home system weighs a mere 35 lbs. When fully assembled, the toning tower dimensions are 48″ (L) x 25″ (W) x 41″ (H). When folded, it can fit under any piece of furniture of similar dimensions with a 4" clearance from the floor. Who Is the Supreme Toning Tower Designed for? Due to safety constraints, the Supreme Toning Tower can only accommodate users up to 6' in height and 250 lbs in weight. Aside from these limitations, everyone can benefit from using the equipment for their fitness routines. Its versatility makes it easy to adjust workouts depending on the user's level of athletic ability. For starters, the sculpting bar works well for beginners because of how simple it is to use. The bar serves as a guide for your body to follow during low impact muscle-toning exercises. The lack of coordination required in body sculpting is another reason why it is beginner-friendly. You may just need a few sessions to practice proper form. Likewise, barre and Pilates fitness programs cater to all levels. Later on in this article, we'll take a look at specific exercises that you can try, depending on your experience. How Does the Supreme Toning Tower Work? If your fitness goals include toning and sculpting your body for an overall leaner build, then the Supreme Toning Tower can help you achieve those goals. By incorporating assorted elements from core conditioning, barre, and Pilates, you give your body the chance to take in the unique benefits of each type of exercise. What Is Body Sculpting and Core Conditioning? Body sculpting, also known as core conditioning, is a strength-based workout that targets the muscles of the torso. It is typically non-aerobic, which means that it incorporates little to no cardiovascular training. Instead, the exercises use some kind of resistance, either in the form of free weights, resistance bands, or a weighted exercise bar. This type of exercise is more about toning and strengthening your muscles, and less about burning calories. As such, it makes it easy to pick out a specific muscle group to work on during each session. You'll also see results sooner, as a result of performing more focused movements. The key to body sculpting is to use heavy enough weights so that you are unable to do more than a dozen repetitions. The best way to build muscle is to carefully overload your body, without going so far that you risk injury. If you are new to weight training, it would be in your best interest to consult a certified trainer, just to get you started. You should also expect a fair amount of soreness when you introduce strength-based exercises into your fitness routine. Despite what you may have seen on social media, barre fitness does not always include aspects of ballet, even if the workout was inspired by the dance. The name just stuck because a ballet barre is used to complete the movements. Sometimes, the movements are influenced by traditional ballet moves, but other times, the positions are also drawn from yoga or Pilates. The best thing about barre is the fact that it is a low impact exercise. For anybody who is suffering from injury, low impact exercises are perfect because they are easy on the joints but still keep your heart rate up. And since barre does take some inspiration from ballet and yoga, the movements incorporate the whole body. The difference between barre and body sculpting, for example, is that while both types of exercise focus on strength, barre pays special attention to body posture. After trying a few barre sessions, you'll likely notice a change in the way you carry yourself—your shoulders will roll back and you'll stand taller, as a result. Pilates combines awareness of the body and the mind into a fitness routine. It started out as a form of rehabilitation for injured soldiers during the first World War. Given that supplies were limited, Joseph Pilates, a military nurse at the time and the inventor of Pilates, attached springs onto hospital beds to integrate resistance training into his rehabilitation program. Since then, Pilates has caught the attention of fitness enthusiasts worldwide. Similar to barre, Pilates puts emphasis on body balance, control, positioning, and posture. But the main difference lies in the mental awareness that is essential to Pilates. Unlike other types of exercise, it's not possible to catch up with your friends during a Pilates workout in the same way that you could if you were jogging on the treadmill. Movements in Pilates are precise, which means you'll need to perform them with absolute control. This is why you need to pay close attention to your breathing. In addition, the postures in Pilates tend to focus more on coordination and flexibility. As your mind and body awareness improves, you'll become more conscious of your posture both in and out of the studio. There are far more advantages than disadvantages to owning the Supreme Toning Tower, but we'll list them all here for you to decide. The first advantage would get us a huge thanks from your wallet. Think about how much you would be spending on a gym membership, plus access to barre and/or Pilates classes! This multi-purpose home fitness system includes everything that you'd possibly need to get a variety of different workouts done—in the comfort of your own home. That brings us to the second advantage. Some people would argue that the convenience of working out at home is simply priceless. 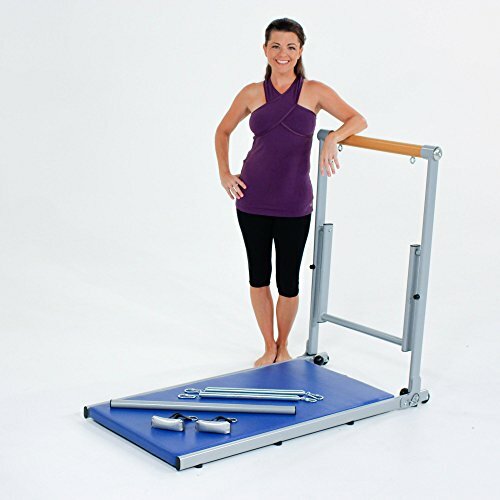 Especially when the Supreme Toning Tower comes with instruction and exercise DVDs, there's really no excuse for not getting started right away. All three types of exercises—core conditioning, barre, and Pilates—are beginner and expert friendly! The main disadvantage of the toning tower would be the fact that it doesn't accommodate users who are taller than 6' or who weigh more than 250 lbs. The other thing to keep in mind, especially if you are a beginner, is that with any at-home system, you may need to seek out professional advice before starting your workout program. Equipped with your very Supreme Toning Tower, here are some exercises that you can try on your own. It's always best to gradually ease yourself into any new fitness routine, so we'd recommend that you give the beginner exercises a try before jumping onward to the more advanced movements. Begin by attaching the two resistance coils to the attachment points on the ballet barre. Then, one at a time, slip each foot into the foot holders and ensure that the arches of your feet are well-supported. To do the exercise, you're going to pedal in the air as if you were riding a bike. Be sure not to let your knees go past your hips as you pedal. Lie down on the mat with both feet on the swing-thru bar in its starting position. To perform a bridge, thrust your hips up to the sky using your legs and hold that position for a few seconds. Attach the two resistance coils to the attachment points on the ballet barre. Then attach the sculpting bar to the resistance coils. Position yourself in between the two springs, so that your body is in-line with the mat. The sculpting bar should be in front of you. Put both hands onto either end of the bar. To complete a chest press, start with your elbows at a 90-degree angle and then push out until your arms are fully extended. Stand behind the toning tower with your body facing the ballet barre. Position your legs in a wider than shoulder width stance with your feet pointing outward at a 45-degree angle. Hold the bar for stability. Start by standing tall, then squatting down slightly as if you are sitting down into a chair, then back up. To make the exercise more difficult, lift one of your heels off the ground. Lie down with your back on the mat. Your hips and knees should be positioned at 90 degrees. Hold the swing-thru bar above your head with both hands. This is your starting position. To do the exercise, lift your back up off the mat and extend your arms so that the bar remains above your head. At the same time, straighten your legs into the air as you stretch forward. Return to the starting position. All in the all, the Supreme Toning Tower is an excellent at-home alternative to a gym or studio membership in regard to affordability, convenience, and overall fitness performance. Reach your fitness goals sooner with the Supreme Toning Tower!